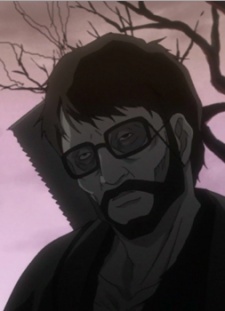 A zombie with a saw strapped to his back and glasses, he first appears in the tunnel the trio crashes into. We see him again in the quarry, loading stones onto a cart with Sabini. Mugen tosses Fuupa his severed arm, which he calmly sticks right back in place. When Shige pulls out the pedigree, Fuupa holds up a candle to reveal the hidden map. After the deal is struck, Mugen asks Fuupa, whose arm is being bound firmly in place by Sabini, for food, and he replies that all they have is wasabi. Fuupa tells Fuu that they are close to the treasure, after she complains about the work, and she notices that his arm is reattached and there’s a line of scar tissue along the cut. Just after, Fuupa is apparently killed in a rockslide, but he shows up again talking to Sabini about how "that Yoritomo" will be deposed and Genji’s rule will end after they find what they’ve spent five years looking for. Jin and Fuu rightly call them out on this, since the events described occurred five hundred years before, but the two take no notice. Fuu runs into them again as she tries to escape the graveyard, mistaking them for living men, and Fuupa’s arm drops off in her hand. Him and Sabini are presumably part of the zombie horde at the end, and also presumably destroyed in the meteor impact.